We are supposed to be saving EVERYTHING to pay for our daughter's years in college, soon to commence, but we went "up the Shore" (of Lake Superior) to the place we had stayed at for a couple of nights in August, with our teenaged daughter. We have a stringent budget; travel money is allocated only for visting family (we are rather spread out). This was a real treat. Our daughter took care of the cats while we went off for our romantic night away. It was so lovely! I felt as if we had had a true vacation, even though we had only been gone a day. Here's a photo we took on the way up there. It had been windy the day before and rollers were still coming in to shore. Can you believe it? 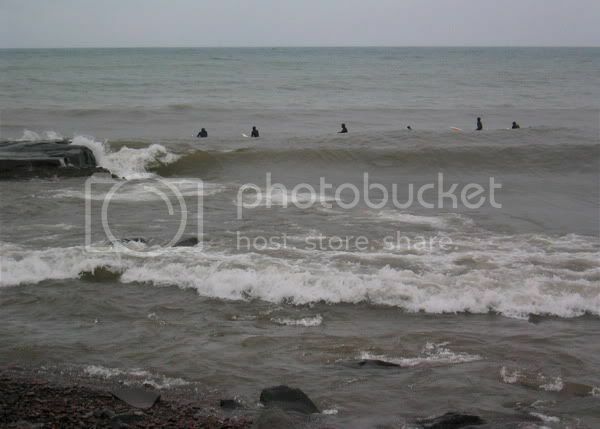 Men in wet suits were actually surfing out on the lake. I saw two surfers get decent rides; we captured one on a bit of film, but I don't know how to post it. You will have to make do with the one below, in which they are waiting for the right moment. It's January -- in Minnesota, for heaven's sake! Normally at this time of the year the lake is frozen. But we've been having one of the warmest winters on record. The high most days since December has been in the 20's and 30's. The day the surfers were out it was above freezing. Amazing! 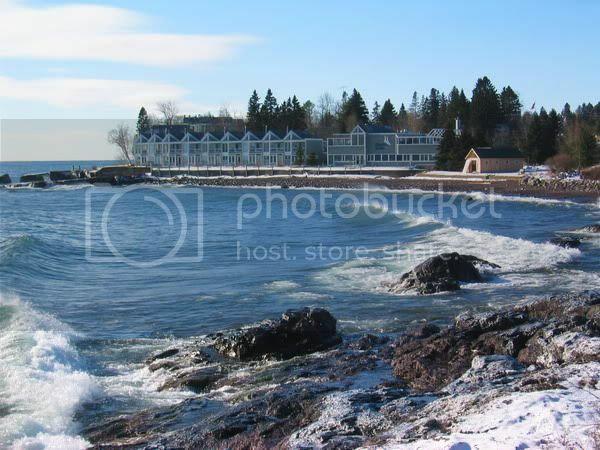 Below is a snapshot of the place we actually stayed, about an hour and half up the shore from here. We stayed in a studio at the left end of the condos in the image, just thirty feet from the surf. The sound of it was wonderful. The problem is, I have got no where on my stalled fanfic; I'm still 150 pages in, five months after posting my last chapter. Paritally, it is because I'd rather send e-mails, post comments (in threads and journals), and prepare journal entries and screencap extravaganzas (celebrating Tolkien and Frodo, Frodo's actor, and, now, Brokeback Mountain), than actually work on the blasted thing. It is SO immediately gratifying to write an entry or a post, and to respond to the people who comment. I am ... addicted to the pleasure of it. In comparison, it is onerous to keep working on a fic I may never finish and few will ever read. But I really do waste a lot of time I don't have to prepare my little LJ and messageboard efforts, after which I click open my e-mailbox constantly, in order to read and answer the responses. I should just gird my loins, swear off, and do what needs to be done. Of course I will browse my f-list and answer my emails, but I will try not to expend my creative energies making entries, nor hover over my email, ready to leap upon the reply notifications. I have been thinking I ought to put all this fandom stuff behind me, but then I get a terrible knot in my stomach and my throat closes up, just thinking about it. Perhaps others of you have been wrestling similar thoughts. Again, I really thank you, Mews, for your graciousness and helpful suggestions. I know that knot in the stomach. It's sister knot sometimes visits me in my moments of contemplating life without my "fannish stuff." And I meant to thank you for making (very) young Mr. Ridiculous Thoughts himself hold still long enough to get my fill of looking at him...I haven't had my fill yet! :D But thank you, your caps are lovely! Now, don't you be talking like that, Ms. Honey. SOMEONE needs to stay and keep the fanfires burning! Glad you enjoyed the "Ridiculous Thoughts" caps. In a way, I have less excuse than ever to be distracted by fandom. The threads have really slowed down -- the ones I have hung out on. My main threads, TORc's Elijah/Frodo thread has a few posts a week, and the The Harem is almost completely dormant. It happened rather swiftly at the end, too. One day we were posting, not heavily but steadily. Then a post sat there. And sat there. Now, every once in a while someone comes in to check the patient, but he's/she's slipping away. I suppose I should consider these endings as reprieves giving me more time. But they make me sad. I'm rather sentimental underneath all the guff. As I think I said to you in an email, dear Mech, it was a total blast being able to share my LOTR-love and Frodo-passion with fans from all over the world. PJ's films enabled my private passion to go public ... and I wouldn't have missed it for anything! But now I am perfectly content to have my private passion back to myself all over again. Hope that makes sense. The friendships I have made remain. I still haven't passed on, though. Nothing has replaced my Tolkien/Frodo zeal. I am in no hurry to leave it behind. It's not as though I'm not open to new enthusiasms. Heck, I read all of the Harry Potter books this summer, didn't I? Saw all the films? But I have never felt inspired to visit a Harry Potter fan site. Yet here I am entering my third year of talking about things Tolkien on line, and reading fics, and I am not done. Not nearly. It just isn't going to be happening for me anymore on messageboards. Actually, I have entered an email discussion with a fan from CA, who happened to email me about a Frodo Art Travesty. She doesn't come from messageboards and almost never visits LJ. We have been filling each other's mailboxes talking about Frodo and LotR. I don't know how long that will last, but I am really enjoying it. But I do miss the camaraderie of the threads very, very much. The LJ experience has not replaced it. Arrrggggh, please don't go away completely!! *clings* I enjoy reading your posts and your comments a lot! It would be a shame if you left! Maybe you should take a week off from LJ to finish your fic? I found trying to do less on LJ difficult, it's so addictive. So when I have something that should take precedence, I rather take a few days off completely than trying to cut down on my LJ time. Exactly! See, I am doing just that! *grin* I had a doctor's appt. just now and had to leave, but here I am, opening my mail at the first opportunity. My work day starts in two hours; I should be writing. But am I? Maybe you should take a week off from LJ to finish your fic? Actually, a week off from LJ would not get my fic written, unfortunately. It took me over a year to write the first 12 chapters (the last five are very long ones), and the fic still is just over half finished. But, having said that, if I had been able to make myself write for just one hour every day, I'd have almost finished by now, instead of having nothing to show for the last four or five months of satisfying myself in the moment, doing lots of short projects. Anyway, thanks for the support, Frodosweetstuff. You are lovely to comment. Hey, don't leave.. this is what serves as my social life! I know what you are feeling though. I am hopelessly psychologically addicted to Frodo, LotR, and fandom in general. (I need to be forcibly committed to a Frodo Rehab center) As a result, I am always tearing around at breakneck speed with a RL that I also have way more stuff to do than I can ever possibly accomplish in a day. It is appalling to stop and think about.. but I'm not giving up the fun stuff. I'm not a writer.. but if it's anything like being a drawer it must consume you and a whole heck of a lot of time. (Isn't it interesting how time ceases to exist when you are doing something like that?.. You look up what seems to be minutes later and the whole day has gone by.) I read once that the main thing in life was to find your muse.. and that you will know when you have found it when time does that. I have a lot of muses all over me. At least we are never bored. I hope you weaken in your resolve. Aren't I evil? I want that quick fix of Frodo caps! On the other hand, I am enjoying the fic no end!!! I don't know if I ever told you this but it is my very favorite. So really, I am torn. I am, even as I take a compulsive break to check my mail, actually going back and fixing the saturation and gamma levels of screencaps I did first (when I was suffering from the delusions brought on by the Dark Monitor), I am so keen to see Frodo 'lookin' good'. I am sure I will keep doing them! On the other hand, I am enjoying the fic no end!!! I don't know if I ever told you this but it is my very favorite. If you go back to "Threshold" writing, best wishes muse-inspired progress! Thanks for the good wishes, Maeglian. P.S. I loved talking about Brokeback with you in PM's. They really helped me process "experiencing" the film the way no other LJ commenting did. Thank you. I'm so sorry you're still stuck with your writing. From past experience I know how these things can just loom and loom the longer you leave them until they seem unsurmountable. I've been struggling a little bit lately too - putting it off as if I'm almost afraid to begin - instead I've been doing silly little time-wasting things. Fortunately, I did manage to force myself to sit down and write and actually finished something yesterday, but I had to be really strict and it's not always easy. I do hope you can continue with "Threshold" - I love what you've written so far and I really admire the beautiful way you crafted each chapter. As for the fandom, quite often I've felt swamped and had to take a week off or limit my on-line time. I check my flist and my emails far too many times a day to be quite sane and I know it. A break is sometimes quite healing. I am glad you're not planning on disappearing, though - I'm certainly not planning on going anywhere, the love of this fandom goes so deep with me and on so many levels. I'm sad to see the Harem dying, I loved that place. Aisling, you are sweet and thoughtful. I know you have been struggling (although a SUPER poem popped out of it all! ), and I really, really appreciated your empathetic support. I am glad you're not planning on disappearing, though - I'm certainly not planning on going anywhere, the love of this fandom goes so deep with me and on so many levels. I'm sad to see the Harem dying, I loved that place. What a beautiful view – you certainly had the Weather Gods on your side. I’m so happy for you both. Gosh 20 years! Not bad at all. I understand your dilemma regarding how to organise your time. I have been trying to cut down my on-line life for ages in order to pursue my RL interests but so far my efforts have been ineffective. I miss you all so much and I never want to give up the Harem. So I’ll just plod on the best I can. Please do not disappear entirely, because your posts, here and at the Harem, brighten up my day no end. For that I am forever in your debt. I would be very sad if the Harem got to the point where: the appointment book had empty pages and you could hear a window shutter banging mournfully in the wind or see a great ball of tumbleweed being blown down the Hill at BEWTE *sniff* . When I set aside time in which to do something creative I can’t get my creative Muse going, no matter how hard I try. On the other hand if I’m working or unable to get to my drawing board my Muse is all raring to go. So typical *rolls eyes*. May I suggest that you take each day as it comes – I’d love to read more of your fanfic and I am willing to wait and be patient. Swedish saying: The wait is never too long when you are waiting for something that is good. The chapters that you have written so far will always be there to be enjoyed over and over again. Estë, you make it almost worth while to have moaned on LJ. What a touch; your words are like cool compresses. Or cucumber slices applied to the eyelids. You know what I mean: refreshing. You are full of good advice, too. That is EXACTLY right. I am always full of ideas at work, come home tired confronted with domestic duties, and fade to screencaps (so soothing!) as the clock ticks. But, that's not the whole story: if I have a day off, I manage to fiddle around, as Igraine/Aisling described, avoiding the actual confrontation with the drafts while I still am fresh. "May I suggest that you take each day as it comes?" That would be so helpful if I could assimilate it. *grits teeth in effort to assimilate* I think half the paralysis comes from looking to far ahead. It daunts me to think how far I have to go. Why didn't I write something short???? Thanks so much for posting, Estë, and for expressing your love of the story, such as it is. Happy (belated) 20th anniversary! It was nice for you to be able to go away and enjoy some time together. Our 31st anniversary is coming up in 2 1/2 weeks. We're not planning anything this year, since Laurie will be still very uncomfortable after his operation. Rather those people surfing in those conditions than me (not that I surf, mind you!). Brrr! While you are having your warmest winter on record, we are still having our coolest summer. In January, we have only had 12 days on or above 30C (86F) and only one over 37.6 (100F). I'm not complaining, because I don't like it when it's extremely hot! Talk about time spent on the computer... I spend far too much time on mine. I get up in the morning, and I turn it on. I get home from work, and I turn it on. I turn it off sometime around 10.30 - 11.00 pm every night. I'm not addicted to it, am I??? :) I read a lot online, and not necessarily post much, but I must have my "fix" whenever I can. Things that need to be done are put off, and I feel guilty, but I can't keep away. It seems we're all suffering from the same condition! With regard to Threshold, we, the members of your fan club are patient, and will still be there when you're able to post your next chapter. We know it'll be worth it. I am so glad I opened this thread up today to edit something! I hadn't got a reply notice for your post, Maewyn. Just another LJ snafu, I guess. Mercifully, I haven't had too many of them, unlike poor Pearl and Maeglian. 31 years! No, he won't be feeling like celebrating. At least the weather may be pleasant while Laurie is recuperating. Heat only makes trying to recover nastier. Hurray! Yes, too much time on the computer is a problem for us fans. But I do think we chastise ourselves too much for sitting there for the reason you mentioned: reading. I was defending my habits to my family and, in this one instance, I think I am right. It looks terrible to keep sitting here, but a lot of the time I, too, am reading. Reading posts, article or fiction. If I were sitting in the living room reading the paper, magazines or books -- which had the same texts in them -- no one would raise an eyebrow. Unfair! Unfair! Thanks for the encouragement on the story, too, Maewyn. You are one of "Founding Members" of the Threshold fanclub, and I feel the warmth of your support. As your teacher...er, Beta, I will have to give you detention and lines if you don't knuckle down to your homework with a little more zeal !!! I have been waiting for five months for the next chapter to check out, and has it been forthcoming ??? No, it has not !!! Self-Discipline is what you need, my girl...and lots of it !! It's all very well getting distracted by this chap, Elijah, and his video antics, but we are talking about a very serious Great Love here, which is at dire risk of drifting away...not to mention your readers ! Are you going to let him pine away ??? Besides, I really need to find out what happens when her children find out that she's been shagging that crank Baggins, from Bag-End...the suspense is fair killing me !! Wendy, your post tickles me. I promise to do better on my homework. Yes, it would be a shame never to make it to the openly angsty stuff. I think over those scenes a lot. If only I would write them! Thanks for bearing with me. I thought you'd be more than fed up by now. P.S. My daughter is trying to watch famous movies, so she'll know better what other posters are talking about on the movie boards she reads. Last night I say with her to watch the first half of Schindler's List (second half tonight). I forgot what a good film it is, so much better than Munich (although that is worth seeing, as I said somewhere else, hopefully not this thread!). I'm glad to see you online tonight. I hope you're feeling a little better. You seemed a little down when you wrote this post. You're probably sick to death of advice, but my advice would be, do what best pleases you. If you need to give your fic or LJ a break, then do so. It's supposed to be fun, not work. But it is a little lonely when our friends go away. The poor Harem is so deserted these days. Oh, we had fun with the Ripper! But the saga kept getting interrupted with RL distractions and the frequent splitting of the thread, and I think that helped kill the momentum. Perhaps something else will come along. You know, the Harem has been dark for so long, apart from a half-dozen posts gamely trying to revive it, I am now grown used to it. I would hate, hate, hate losing LJ at this point, too, though. Thanks so much for that writing advice and encouragement, Mariole. Actually, I felt a little burst of inspiration this afternoon, cheered when I went to "Open Scrolls Archives" - OSA - to do a fix I saw needed in Ch. 12. (That's one of the places my fic is at.) I lost my trusty desktop link, so I looked for the story again by using their search function, entering my title, a way of opening it I never use. With my trusty link, I just go straight to the chapter listing. Anyway, when the story opened in that format, with its little one sentence blurb, I saw it had made it up to five stars. I know it was silly, but I was so pleased - not so much that there were five stars, it had had four after it had been up a week. But that the story made it to five -- that meant that someone else read it (and liked it)! Woo hoo! Today, I at least opened the latest never-written chapter (still five pages in, the same five pages, since September), and felt some actual pleasure working on it. I even squeed over a paragraph. It helped listening to selections from the Brokeback Mountain CD. It's so subtle, but so full of mood, like light shifting over a landscape (hmmm...sounds like Canada pretending to be Wyoming!). Shees, but I love the original music for that film. p.s.s. And my best friend and I finally made plans to see Brokeback Mountain this Thursday night. :) When does Rufus' song play, I'll keep my ears perked! Ah, Lembas, we certainly have had some *splendid* Frodo talks, have we not? *naughty snicker* ("Yes, verrrrry 'shweet'.") I have loved them, too. If I ever produce a chapter 13 of Threshold, I shall look forward to your typically astute and entertaining annotations. When does Rufus' song play, I'll keep my ears perked! It plays during the end credits, after Willie Nelson's tear-jerker. I look forward to hearing what you thought of the film. I hope all this talk hasn't spoiled it for you, either by too much info. or by building your expectations too much.